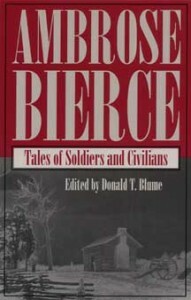 This revised edition of Ambrose Bierce’s 1892 collection of “Soldiers” and “Civilians” tales fills a void in American literature. A veteran of the Civil War and a journalist known for his integrity and biting satire, Ambrose Bierce was also a lively short-story writer of considerable depth and power. As San Francisco’s most famous journalist during the late-nineteenth and early-twentieth centuries, Bierce was hired by William Randolph Hearst to write a column for San Francisco Examiner, where his “Soldiers” and “Civilians” tales first appeared during the late 1880s. By the standards of his day and ours, Bierce’s journalism was often brilliantly insightful, viciously libelous, petty, and grand, frequently in the space of a single paragraph. This edition reveals the often compelling artistry of Bierce’s original versions of the tales and the intentionally intricate design and scope of the original collection.